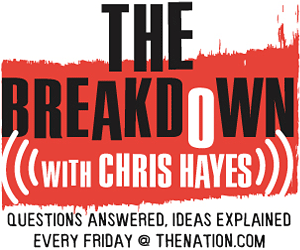 The Breakdown: Will the Tea Party Stall the Economy? The Center for Economic and Policy Research's Dean Baker joins Christopher Hayes to answer the question: if Tea Party freshmen vote to not raise our debt ceiling as they vowed to do on the campaign trail, will government grind to a halt and bring the US economy down with it? In the wake of Tuesday's election, citizens across the country are trying to predict how Congress's drastic shift to the right will play out in terms of jobs, public funding and the economy in general. Mainly, Americans want to know, what happens when the anti-Washingtonians get to Washington? On this week's episode of The Breakdown, co-director of the Center for Economic and Policy Research Dean Baker joins Nation DC Editor Chris Hayes to answer the question: if Tea Party freshmen vote to not raise our debt ceiling as they vowed to do on the campaign trail, will government grind to a halt and bring the US economy down with it? In the wake of Tuesday’s election, people across the country are trying to predict how Congress’s rightward shift will play out in terms of jobs, public funding and the economy. Mainly, Americans want to know, what happens when the anti-Washingtonians get to Washington? On this week’s episode of The Breakdown, co-director of the Center for Economic and Policy Research Dean Baker joins Nation DC Editor Chris Hayes to answer the question: if Tea Party freshmen vote not to raise our debt ceiling—as they vowed to do on the campaign trail—will government grind to a halt and bring the US economy down with it? Dean Baker’s blog, Beat the Press. Baker’s column with the Guardian. Congress.org article on potential clash between the GOP and Tea Party freshmen on the debt ceiling.